I know it took forever, but I am finally revealing our new camper home! First sorry for the delay, it’s was due to publishing date commitments and ya-da-ya-da, I won’t bore you with the details. No matter it’s finally here, and I am excited to share my new home with you. In case you haven’t been following over a year ago, we made the decision to move into a tiny home. We moved into our 150 sqft vintage camper full time but after eight months we realized we needed a little more room. After some searching, we purchased a 2002 Fleetwood Wilderness GLX 30 5G. In the middle of a sweltering summer, we took on the task of remodeling. Let’s take a tour! 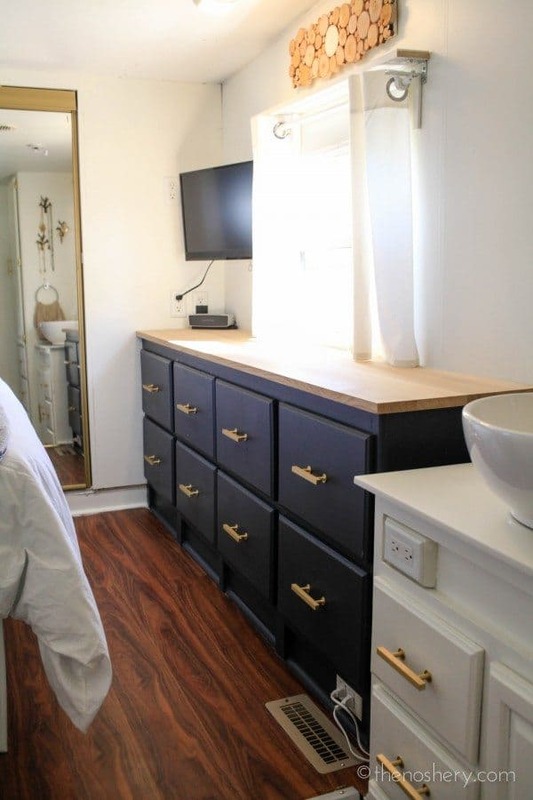 I wanted this tiny home to be welcoming but have a modern luxe feel. We did this with contrasting bright and dark colors and heavy brushed brass fixtures. We painted everything but the floor and ceiling. We also replaced all of the furniture. The original recliners where large white leather recliners. They looked like the children of the stay-puff marshmallow man. I was able to find some smaller gray recliners that fit perfectly into the living area. The dining table is the original table. The dining chairs, however, I found several years ago in a breakfast restaurant. 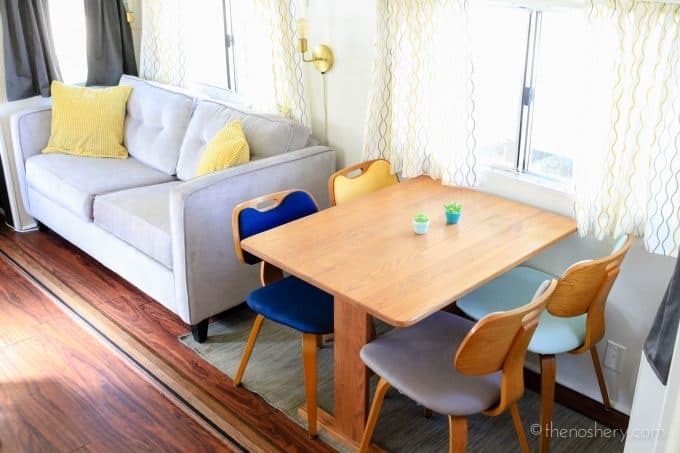 I had them in storage and reupholstered them in a variety of modern colors. On of the challenges I had was figuring out what to do with the light fixtures over the sofa and bed. They were sad 90s glory and I needed something cool and modern. I decided on the Downtown Minimalist Plug-in Sconces with Edison Style 1910 Era Bulbs. They come in over 20 color options! You can even choose what color you want the cord. I went with a white and gold cord. I LOVE how they look! They are the perfect addition to my little house! My pride and joy is my new tiny kitchen. You can see that all the upper cabinets are white, and the lower cabinets are a dark gray. 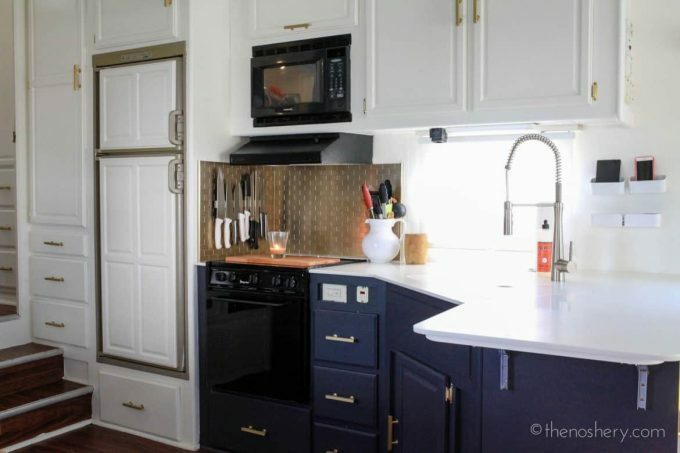 The light in the picture gives the cabinets a blue hue but in person, the paint is more of a deep gray. You can see the entire painting process in my post How to Paint Camper Interior. I chose the Aspect champagne stainless steel subway tile backsplash to match the cabinet pulls. The surprising thing about this backsplash is that it’s peel and stick. Very easy to install! It looks fantastic and easy to clean. We also had the countertop replaced. We decided to do this for two reasons. The original countertops were hideous and I wanted to install and under mounted sink which required a new counter top. The under mounted sink was the best decision. I looked for hours to find the right sink and decided on Moen 2000 Series 18-in x 24.75-in Double-Basin Stainless Steel Undermount. It was the perfect size for my tiny kitchen. I needed a sink that was deep and compact, and this sink was perfect. Also, by under mounting the sink I was able to use the sink cutouts as covers to optimize my counter space. Now when I prep I can keep the smaller basin uncovered for washing. I also decided on a commercial pull down faucet. I prefer this kind of faucet to a retracting head for two reasons, I think it looks cool, and I don’t have to worry about the retraction mechanism going bad. Finally, in the kitchen, we added a drop down leaf. The original counter cut off at the edge. Considering I spend most of my time in the kitchen counter space is a high priority. The drop leaf was the perfect solution. I wanted the bedroom to feel more cozy. I love that the head of the bed is tucked into the slideout. It creates a very cozy alcove. I wanted the bedroom to be bright with just a few punches of color. Over the bed was another set of sad 90s light fixtures. 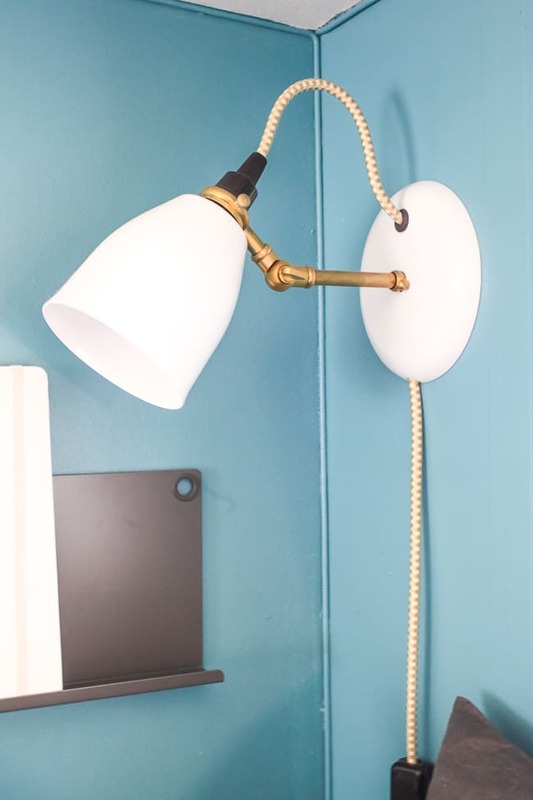 What I really wanted were some reading lamps and I fell in love with Barn Light Electric’s Lovell Porcelain Plug-In Wall Sconce. They are perfect because they can be adjusted for when you want to curl up in bed with for favorite book or magazine. Keeping with the brushed brass theme of the cabinet hardware I decided on the white with brass arm and gold and white cord. I love how it’s simple with a touch of industrial. Also, the light switch sits high on the cord which makes it easily accessible for turning off and on. At the foot of the bed is the dresser. We painted it the same deep gray as the kitchen cabinets and continued the brushed brass cabinet pulls. The top of the dresser was laminate. We asked the same people that make our kitchen counters to cut and sand an oak top. It gave the dresser a more homey feel. Finally, we also changed out the sink, counter, and faucet of the bathroom. 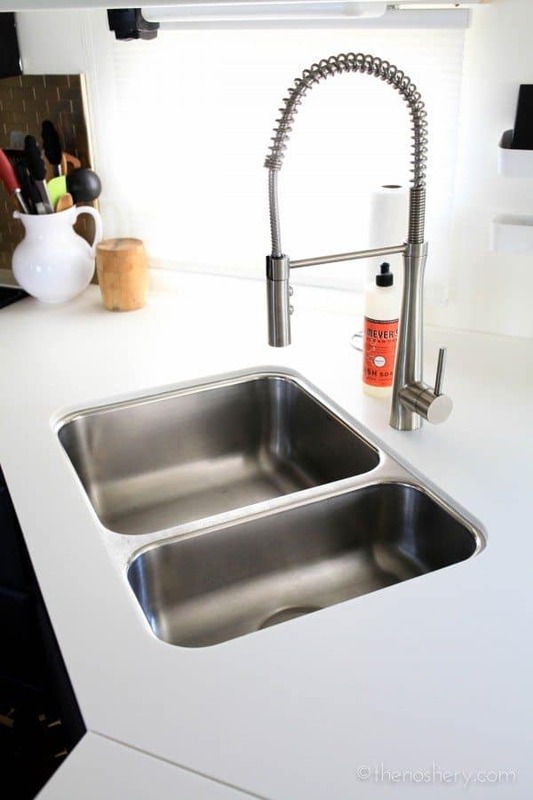 The vessel sink leaves counter space and is still great for washing. Thank you for visiting my tiny house! Also, make sure you check out Domino and Brit + Co. for features and interviews about my tiny home! ** All product and supplies provided by Lowe’s. Light fixtures were provided by Barn Light Electric. All opinions remain my own. 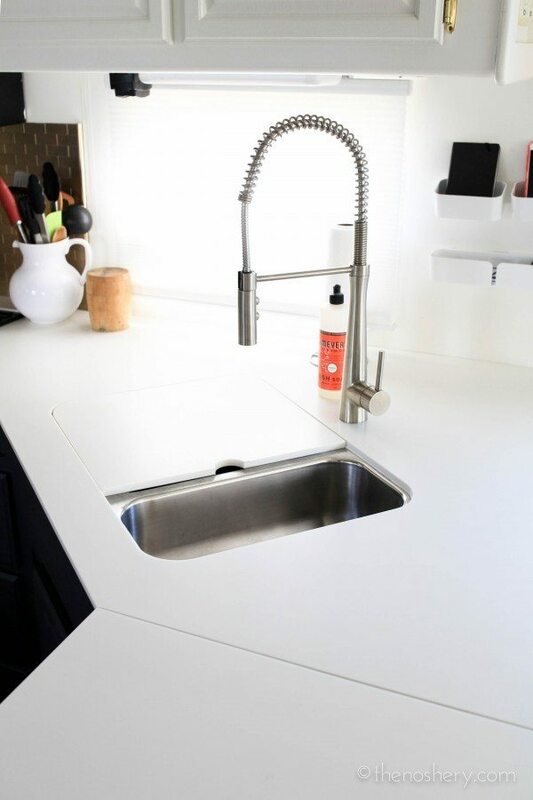 What kind of countertops did you end up going with? Where did you end up getting your countertops done? I contacted a small local independent counter/cabinet maker and he had one of his employees do it as a side project. Where did you have your countertops made? Beautiful! Where did you find the jewelry hangers in the bathroom? Believe it or not I found both of them on Wayfair. I am absolutely in love with your camper home! This is EXACTLY what I want to do. Thank you so much for the inspiration. I appreciate the time and effort you put into making this article. Thank you so much for these! LOVE the remodel! My question is how did you secure the lamps and the shelf on the bedroom wall? I’m terrified to screw in anything since I assume the walls are thin. 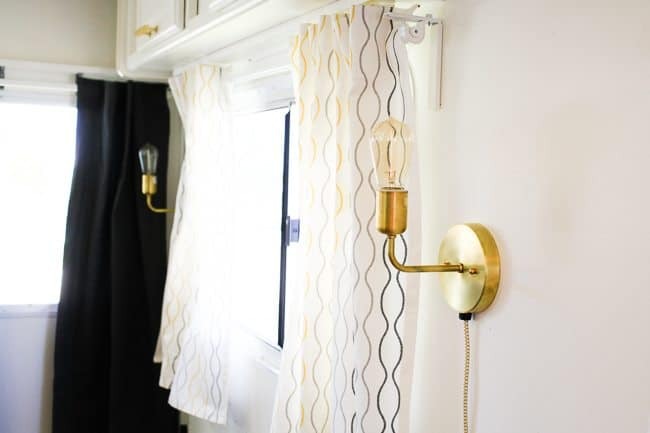 My RV is new so I don’t need to remodel but the comfy “at home” touches are wonderful. Great job! The lamps replaced some lamps so there was already a box to support the lamps. Since the shelves were pretty lightweight on only used to hold a book or our phones we used heavy duty 3m Command Strips to secure them. There are strips that can hold a large picture, so they hold quite a bit of weight. Almost, everything decorative is secured with Command Strips. Hi, I really like what you did with your camper. We’re headed to go FT camping in several months. We have a travel trailer that I need to remove/replace furniture with more dog friendly material. We now have three goldens. I saw a few people ask but I didn’t catch a response to getting more info on the couch and chairs. That’d be helpful because our main living areas look the same. Thanks! I don’t have much in regards to pet-friendly furniture besides looking for leather furniture. For this camper all I did was reupholster the benches with vinyl. Fabulous renovation – very inspiring! 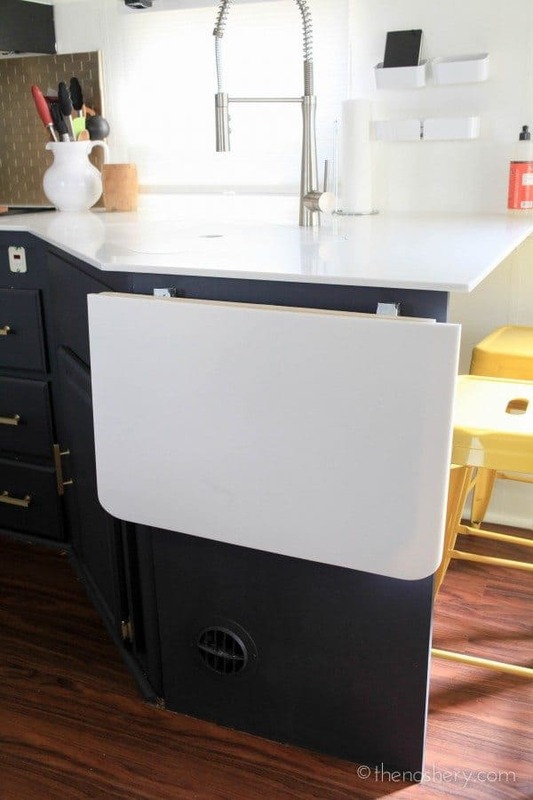 Who did you get to install your counter? We have a 5th wheel and both Lowes and Home Depot (plus a few local solid surface counter shops) refuse to do it because it’s a 5th wheel so we’re stumped! 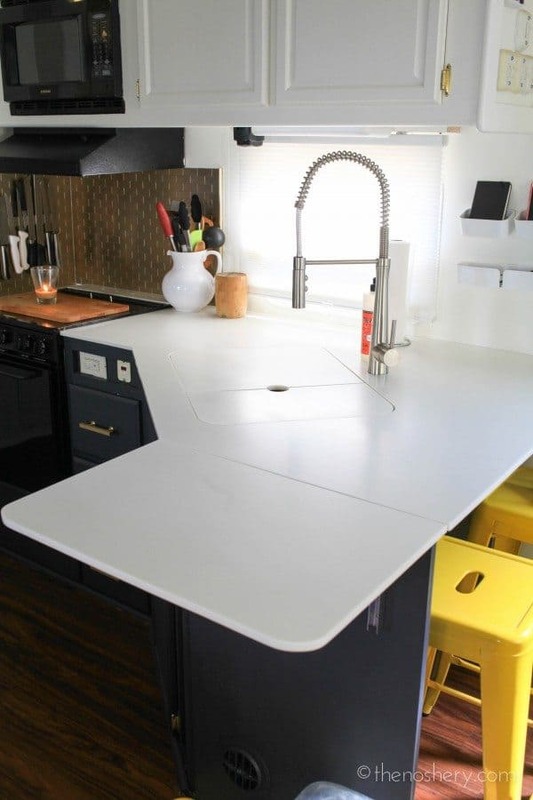 We went to a local cabinet and counter business and ordered a solid surface slab. We then asked if he knew of any of his workers who was willing to do the project on their free time because it was so small. Love it, where did you find the extension for the kitchen counter. We had it added on when we replaced the counter top. You did such a wonderful job but wow,what a massive amount of work!! 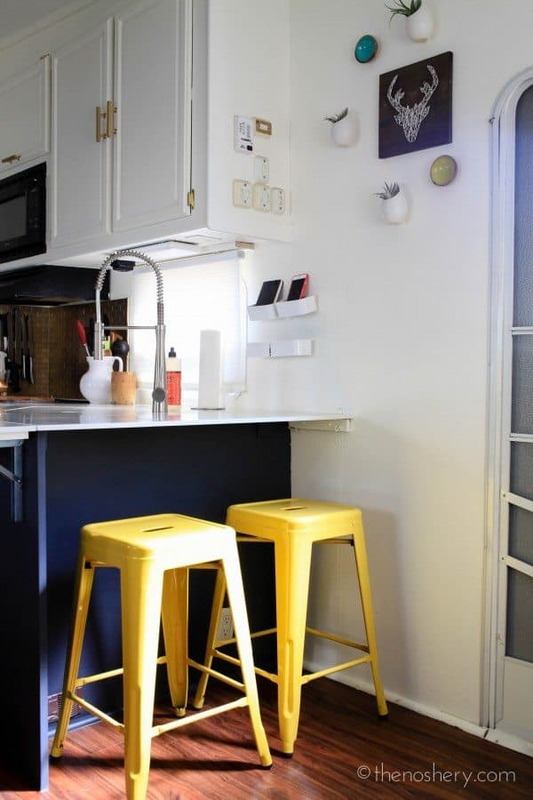 I’m happy to know it IS possible to paint over the cabinets and vinyl(?) walls, but I can see I’ll have to hire someone to do it for me (I’m too old to tackle such a physically demanding project). I’m inspired! This is a beautiful renovation, great inspiration. I was wondering how easy it was to remove the old countertop. We’re you able to do it yourselves? The counter top was easy to remove. If you look under the countertop you will see some screws. We simply unscrewed it and gave it a few whacks to remove lift it and remove it. There are many videos on YouTube demonstrating how to remove a countertop. Thanks for sharing your project. This is the EXACT camper that we’re getting from my parents this summer. They bought it new but no longer travel. We bought land (12 acres) east of Dallas and built a Tiny House on foundation. It took me and my wife 3 years worth of weekends to complete (are they ever done!) it. We’ve added a solar array, water cistern and are in the process of learning beekeeping for Agricultural Tax Exemption purposes. Our goal is to get our total housing costs (utilities, taxes and insurance – no mortgage) down to under $100/mo. We’re at $170/mo now but the ag-exemption will drop that significantly when it kicks in. We’re going to move the Wilderness onto the property to use as a guest apartment when people come to stay for the weekend/summer etc. It’s the perfect way to add living space without adding property taxes and additional insurance cost. I love the thought and ideas that you put into your project. Most are simple but they made a huge difference to your trailer. We don’t have to make or keep ours road ready. I doubt we will ever travel in it but I would love to have something stylish for our kids and grandkids to stay in. This is perfect! If you are ever in the Dallas area, please let us know. We’d love to give you a tour of our Tiny House and property! 🙂 Our blog is at DreamsByTheAcre.blogspot.com. You can also find me in the DFW Tiny House Enthusiasts page on FB. Thanks, again!! Your redo is soo cool, pretty and creative. 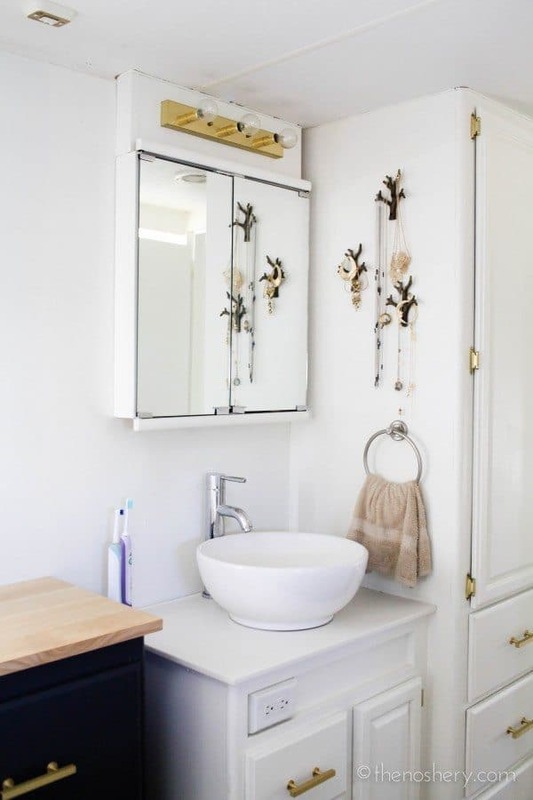 Where did you get the ‘jewelry tree’ in the bathroom area? 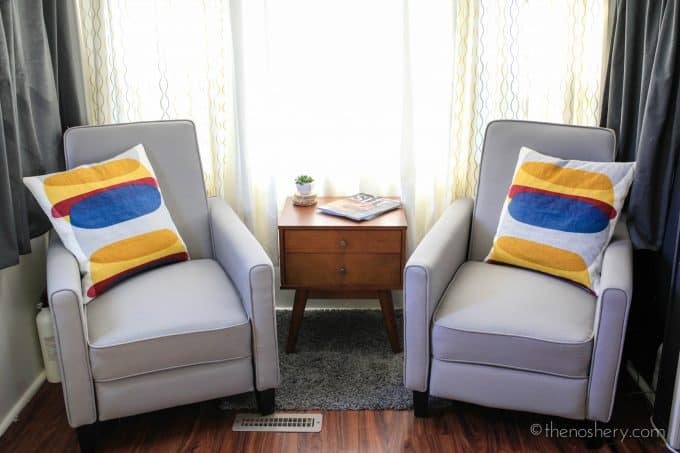 Where did you purchase the two relining chairs? What brand are they? Yes I would love to know too and also the couch! Please please tell us! Thank you for sharing all this! Your make over is inspiring. Our version of your tiny house is a 36 foot power boat. My husband and I both really like the small recliners you found. That we both agree is a happy coincidence! Would you mind sharing the manufacturer or the brand name and where you purchased them? I absolutely LOVE your remodel! It turned out beautiful. We are in the process of purchasing our own RV and I’m so inspired to attempt upgrades to modernize the décor. I was curious about how you replaced your counter. Did you take your trailer to Lowe’s to provide the measurements and they produced and installed it for you? Such a nice job. I love this makeover! I have been dying to try RVing full time but I am having trouble wrapping my head around the in between traveling’s. Where do you stay? the local RV lots? or do you have other places you stick with? 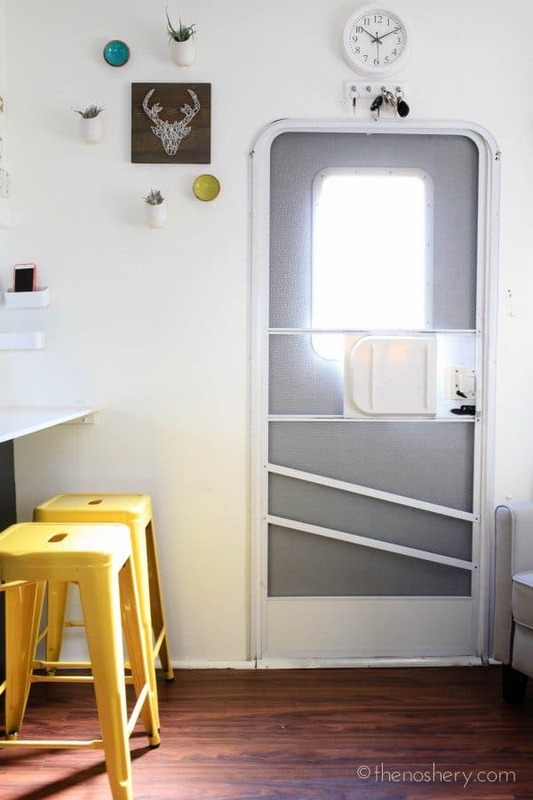 I am absolutely in love with your camper home!!! This is EXACTLY what I want to do. Thank you so much for the inspiration. I really feel like now I can do this!!! LOVE LOVE LOVE!!!! 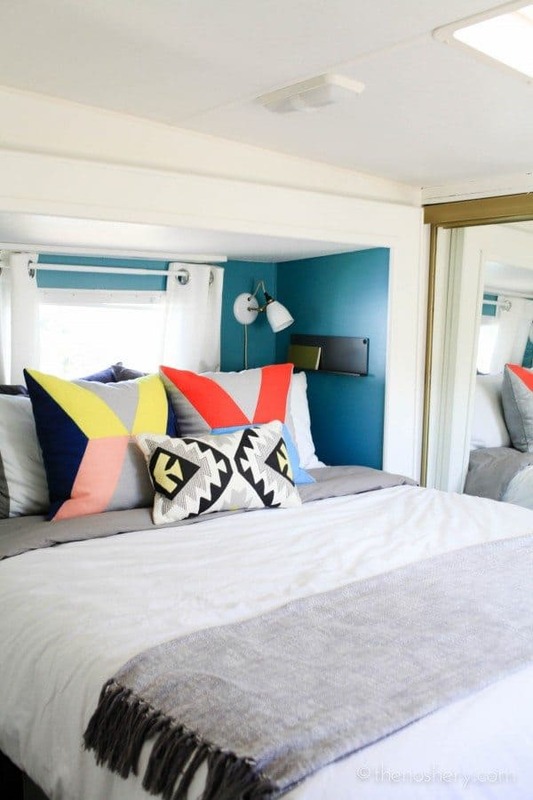 This gorgeous transformation is inspiring my own trailer make over! Mine is tiny but your ideas of making things super functional with flare are something I hope I can learn from. Absolutely adore your style! This is my first project like this…hope it can be half as wonderful as yours!! Thanks for sharing!! Your camper is beautiful. I love the furniture you chose and your colors. Thanks for sharing! Hi! Just popped over from Pioneer Woman and saw this post. Fabulous! I have no desire to live in anything so small, but it is a popular trend. 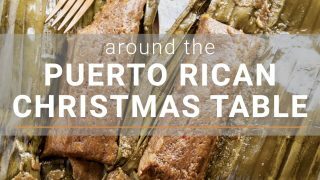 So, I wonder how you cook anything, let alone the yummy looking recipes I’ve noticed on your blog today? My kitchen is not large (but larger than yours!) and I never have enough space. If you haven’t done one already, I’d love to see a post about how you manage in the kitchen, including a few in-progress photos. Thanks. I’m off to Pin a few of your recipes. I can’t get enough of your camper remodel! 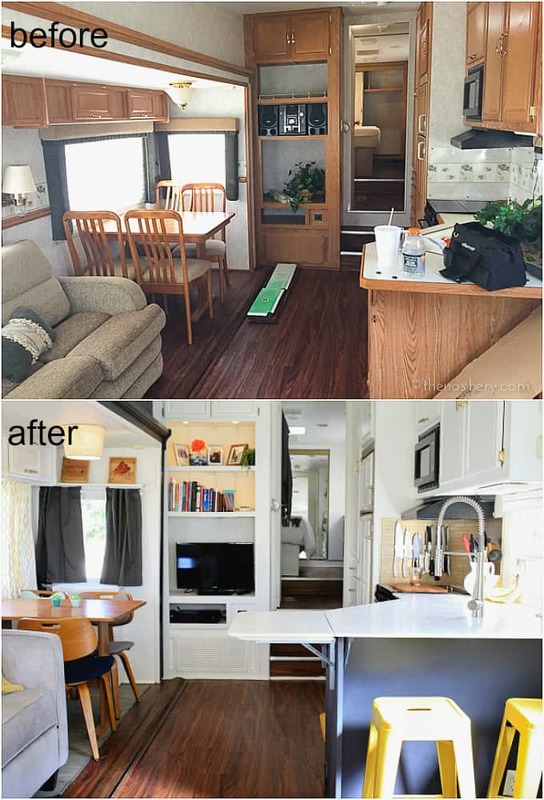 I’ve become obsessed with updating our 93 travel trailer and your remodel is by far the best one out there (I’d know, I’ve put in some serious internet search hours!!!). Everything is so beautifully executed and your choices/finishes are dope!!!! Thankyou for sharing your amazing Tiny Home. I have a small motorhome which I am dragging from the 70’s into the now. Your pictures have inspired me, so again, thankyou. A tiny house is my husband’s DREAM and yours is so perfect and doesn’t look like a jigsaw puzzle – just clever and warm. Congrats! I love your home! It’s neat to see the progression from your first camper to this one. One question – I’m curious about the bathroom/bedroom layout. Are they open to one another? The sink is open to the bedroom and the shower/toilet area are separate & closed across from the sink. Just beautiful- what did you use for your kitchen counter top? I am thinking about doing this to a camper, I’ve been tossing around the small living adea for a few years now. this is so inspiring. I love what you did. Right now we are living in an RV park, so everything is worked out. It’s so beautiful! Amazing job – kudos to you! Do you plan to do this again someday??? 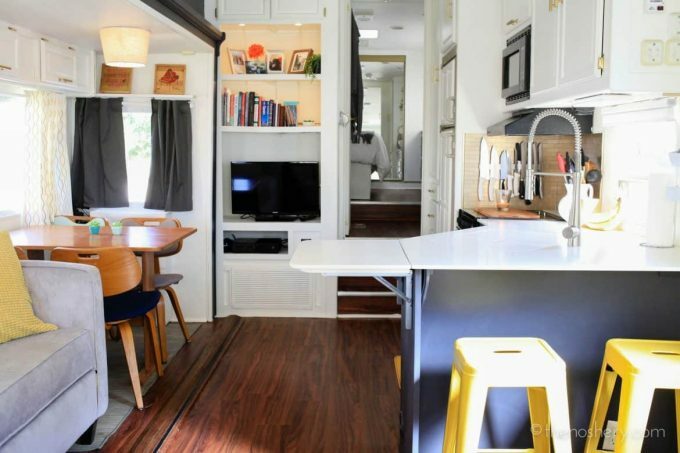 Living small and re-vamping camper seems to really be taking off! 🙂 Also, love your site and all the yummy recipes! Thank you! I agree! This is a stunning transformation. What have you done with your smaller camper? 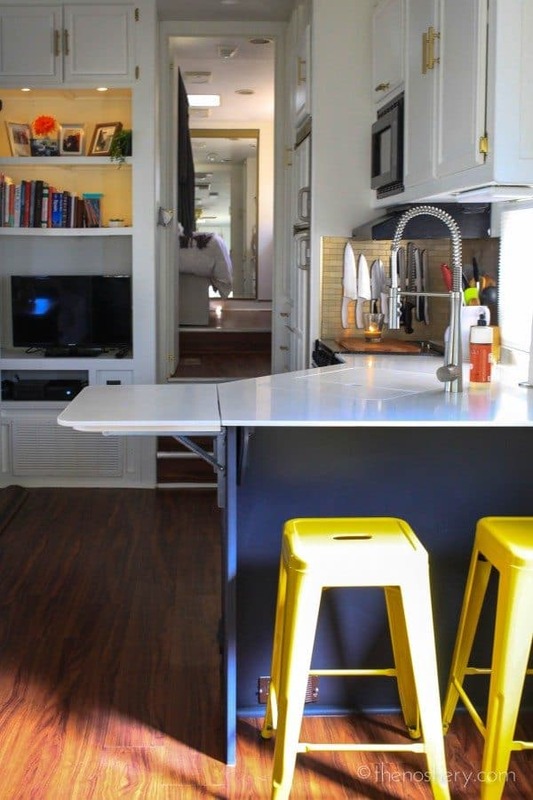 I shared your gorgeous camper with tinyhousetalk.com! I hope you don’t mind! I hope they pick up your story. We are planning to do the same thing within a year, and I have begun to look for good trailers for sale. We want to take our home with us as we travel in retirement. This is so cool! And everything looks absolutely beautiful.